Traumatic brain injury, as the very names suggests, is an injury to brain tissue caused by some kind of trauma. In majority of cases the damage results from a violent blow to the head. In such case the brain collides with the firm skull. If the collision is severe enough, there will be significant damage to brain tissue and blood vessels in the area. 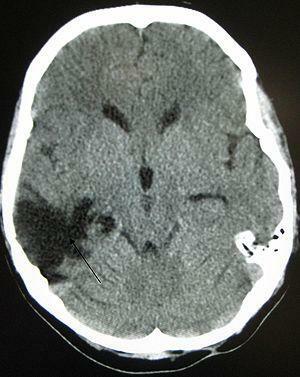 Furthermore, traumatic brain injury also happens if something penetrates the skull and damages brain tissue directly. For instance, this occurs in case of gun shots to the head or penetration of any sharp object through the skull. Mild traumatic injuries cause no significant damage to brain functions. More complex injuries, however, are connected with severe loss of certain brain functions. Such loss may be sometimes permanent causing different degrees of disability. Death is the most severe complication of traumatic brain injury. Treatment for traumatic brain injury basically depends on the severity of the injury. Mild injuries need not to be treated. The recovery is achieved with rest and over-the-counter pain killers (they reduce headache). Such individuals require close monitoring at home and regular check-ups, particularly if the symptoms persist or become worse. Moderate and severe traumatic brain injuries represent medical emergencies. It is essential to supply patients with oxygen and pay attention to their blood circulation, blood pressure etc. Treatment continues in the emergency room and intensive care unit inside a hospital. The goal of the treatment is to reduce secondary damage to the brain caused by inflammation, bleeding and reduced oxygen supply. Patients may receive different medications depending on many factors. For example, diuretics reduce swelling of the brain and increase urine output. Symptomatic treatment includes anti-seizure drugs, pain killers etc. Under certain circumstances doctor may opt for induced coma. Temporary coma is an excellent choice which can help patients with severe brain damage. In people who are in a coma, the brain does not need too much oxygen and can heal better. Surgery is performed in order to minimize damage to brain tissue, remove blood clots and repair skull fractures. By opening the window in the skull, pressure inside the skull can reduce and damage is minimized. Rehabilitation is an essential part of the recovery, helping patients to relearn basic skills and improve all the functions that have been damaged but not completely lost. Rehabilitation plan is created by physiatrist, occupational therapist, physical therapist, speech and language pathologist and neuropsychologist or psychiatrist. There are several more medical and non-medical professionals participating in the process. All in all, while some patients fully recover, others may end up with different neurological or other sequelae.